Everything starts with some fresh canes. Canes from manually harvested fields are delivered to the factory in one piece, stripped from their foliage. Mechanically harvested canes are delivered in 20-30 cm (8 - 12 in) billets. Uncut canes are brought to the factory on carts. In some parts of the world, these carts can be pulled by oxen, although becoming more a folkloric display than an actual transport mode. Cane billets are usually delivered by dump trucks or trucks with moving floor trailers. 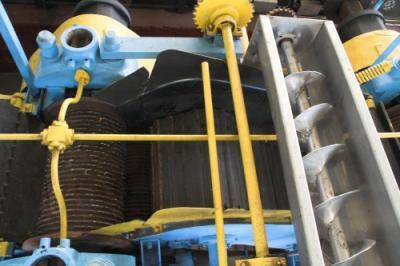 Moving floors enable the unloading of cane without lifting the load. Manually harvested canes are cut into 20-30 cm (8-12 in) billets (like mechanically harvested ones already are) and cleaned once again with a light rinsing. Cane billets are fed into several mills. Canes go several times through those mills and regularly rinsed with water to maximize sugar extraction. The liquid extracted is fresh sugarcane juice also called in the French West Indies vesou. 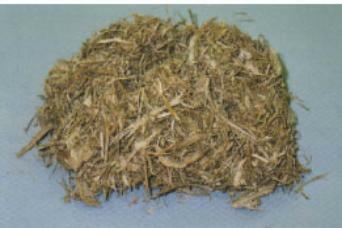 Grinding residues are made of a fiber called "bagasse". 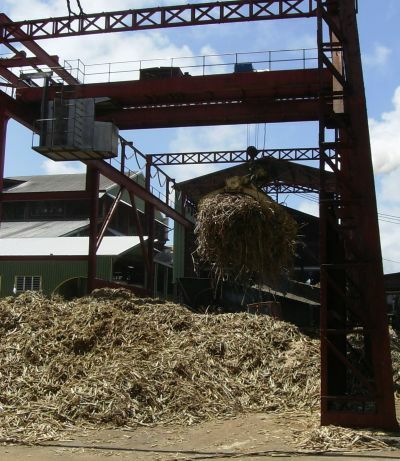 Bagasse is used as fuel for the boiler which provides powers the grinding mills and the distillation column. Vapour can also be used to produce electricity for the distillery and some distilleries actually sell electricity surplus to the grid. Bagasse is also used in the building industry to make insulating panels or as a substitute for cellulose or fiberglass. Living cells create energy through sugar oxidation, a process called cell respiration. Usually this process consumes oxygen and releases carbon dioxide and water. Lactic acid fermentation: used by muscle cells when oxygen supply is insufficient. It's also the process used in making yoghurts or sauerkraut. Alcoholic fermentation results from bacteria or yeast activity. It lies at the roots of alcohol found in rhum agricole. Mankind has been using yeasts from the dawn of humanity to turn sugar into alcohol (beer, wine, ...) or to make bread rise. Master batch: a sample from vesou is pitched and heated to foster fermentation. When the fermentation is well established, the tank content is sent to pitch the other vesou tanks. 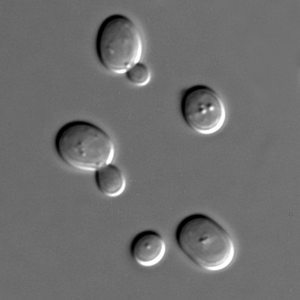 Yeast strains are also industrially bred as in the straight pitching technique. Fermentation is an exothermic (heat generating) one. Since most yeasts cease activity or eventually die above 35°C (95°F) and rhum being produced in tropical climate, temperature control is hence vital in order to avoid reaching excessive temperatures. Limiting the temperature also avoid contamination from other yeast or bacteria strains. To further limit the temperature, batches are more watered in the south of Martinique as temperature are usually higher and water supplies too scarce to allow tank dousing as in the north part of the island. The fermented liquid, locally known as vin is hence lightly concentrated in alcohol (3% to 6% abv - 6 to 12 US proof), a value well below maximum concentrations usually attained by yeasts (usually under 20% abv / 40 US proof). This very low alcohol concentration affects the way distillation is conducted. Agricole rhum: The solution is pure fresh cane juice, also called vesou. 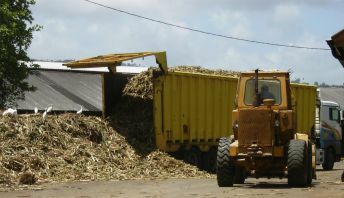 Fresh sugarcane and its juice have to be processed quickly as wild strains of bacteria or yeast found on the cane peel are prone to develop and later the quality of the product. Rhum agricole has hence to be made close to the fields where the cane grew. Rhum agricole is therefore a terroir product. According to A.O.C. specifications, fermentation must be discontinuous and conducted in open tanks whose capacity does not exceed 500 hectolitres (13'208 US gallons). In a continuous fermentation process, fermentation starts at pitching and ends when the sugar supply has been exhausted or the ethanol has reached toxic levels for the yeasts (usually under 20% abv). As for rhum the limit is the sugar supply exhaustion as the vin has an typical concentration below 6% abv. Fermentation (from pitching to distillation) has to be made under 72 hours and temperature has to remain below 38,5 °C (101°F). Fermented solution minimal concentration is 3,5% abv (7 US proof). acidification (pH lowering) which ensures yeast protection against bacterial contamination. Distillation appeared well before rhum agricole and seems to be known from the 3rd or the 4th millennium B.C and could have originated in Mesopotamia or in Pakistan. Distillation was at first intended to produce essential oils (rose, ...) rather than alcohol. Distillation was conducted using apparatus similar to the on illustrated here. An aqueous solution was heated and the small droplets condensing on the lid were conveyed towards the peripheral gutter. The solution in the main tank was hence more and more concentrated. Distillation was later perfected by alchemists searching for the philosopher's stone. They made the first "aqua vitae" (water of life), supposed to bring longevity. From 1000 AD, Abulcasis (Abu al-Qasim al-Zahrawi) an Arab surgeon in Cordoba, distillates wine and later at the 12th century, European alchemists perfected the process. Alcohol is produced in very small quantities and is only use as a medication. Alcohol kept its medication status until the 15th century. In 1411 tax papers attest the sale of aygardent (burning water) in Gascogne (South west fo France) and the alcohol business did not really develop itself until the 17th century with whisky, vodka and cognac. Distillation is a method of separating the constituents of mixture (either a liquid or q gaseous one). It is a physical process and not a chemical reaction using the different boiling temperatures of the constituents to separate them from the others. In the rhum agricole context, we are dealing with alcoholic distillation, a way of separation alcohol from water. Alcohol can be segregated from water thanks to the different boiling temperatures (78,4°C/173°F for ethanol and 100°C/212°F for water). Alcoholic vapours are first to get out of the heated solution. Cooling those vapours creates a solution more concentrated in alcohol than the first one. Since the solution to be distilled contains other constituents than ethanol and water, the distilled liquid contains some of these too. Some constituents are undesirable (i.e. methanol) others are highly sought as aromatic components which gives rhum its distinctive perfume. Those aromatic components are specific to the way the rhum was produced (fermentation, distillation, ...). (d) Condenser where vapors, cooled by a water flow, condense. First modern stills were created by Albucasis. Those apparatuses quickly cooled the alcoholic vapours, enabling the operator to retrieve liquid alcohol. During the 19th century, distillation technics were perfected with the introduction of reflux stills. Those alembics were imported from English speaking islands since those islands' rums were highly regarded with a quality clearly outperforming the quality attained ion the French islands. Those apparels are adapted and called Père Labat alembic even if the priest actually died more than a century ago, without even designing anything close. 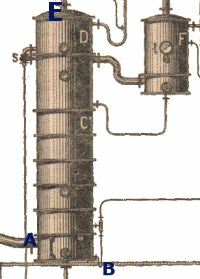 From the second half of the 19th century, distillation went continuous with the introduction of column still distillation. From the second half of the 19th century, new distillation devices are introduced in Martinique. Those devices are adapted from the apparels used in the production of alcohol from sugar beet and are producing alcohol through continuous distillation. This way of distilling is said to be continuous as the liquid to be distilled does not need to be injected several times in the device. The distilled liquid, stays in the column as long as it is necessary for alcohol extraction. These devices offer better yield in means of energy consumption and can handle large batches in short times. This fast process is essential as sugarcane tends to be extremely perishable and the vésou being easily spoiled under the West Indies climate. Sugar beet designed apparels had to be heavily adapted to the rhum specificities. Rhum produced in the first imported columns were of extremely low quality. Separation of the heart from the heads were poor and the low exposition time of fermented vésou to heat did not help in producing the esters so specific to agricole rhum. Columns had to be adapted to the agricole rhum specificities. Trays had to be enlarged to increase the vésou exposition time. Esters are essential to the rhum agricole's bouquet. These complex esters being stripped away in the original devices, the number of enrichment trays has also been reduced to avoid their excessive elimination. 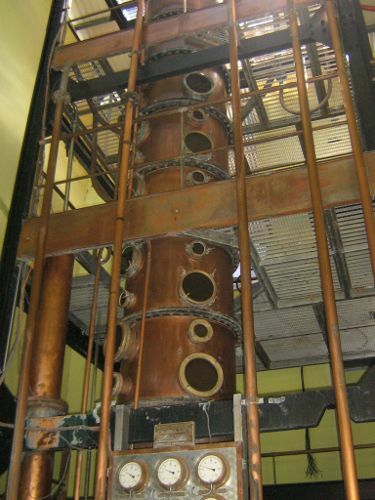 The Creole distillation column, devoted to rhum agricole, was born. Distillation columns are made of several trays. Each tray is a level of the column where descending liquid meets the ascending vapours. The vapours get richer in alcohol and aromas aqs the liquid gets poorer. The stripping section of a column is situated below the feed point. The trays of this section make ascending vapour bath in pools of descending liquid. The enrichment section of a column is situated above the feed point. The trays of this section do not handle the liquid fed into the column but rather make the vapour coming from below richer in alcohol. F: Heat exchange device which cools extracted vapours [E] and heats then incoming fermented vésou[C] and reflux[D]. Enrichment area is situated between C and E.
The stripping section receives in its lower part the vaporized water supply and hte fermented vésou to be distilled in its upper part. The vapours go up through the trays and dabble in the liquid vésou which is going down. While dabbling, the vapours strip alcohol and aromas from the liquid. At the bottom, the stripped liquid gets out of the column. This remaining liquid is called vinasse and is usually from 2 to 3 % abv (4-6 US proof). The vapours coming from the stripping section travel across the enrichment zone. These vapours have been enriched with alcohol and aromas taken from the fermented vésou and come out of the column on the top of it. They are cooled and turned into liquid. A part of that liquid, called reflux is injected back to the column on the upper part of the enrichment section. This reflux is made of the heaviest compounds (mainly aromatic compounds) of the distilled liquid. The reinjection of the aromatic compounds helps getting rid of some of the bad tasting ones. The reflux reinjection also allows to reach higher concentration of alcohol by reducing the percentage of non alcohol compounds. Some facilities only reinject a small part of the reflux. The rhums hence produced tend to be more aromatic since fewer heavy compounds are removed. This way of producing rhum calls for more carefully monitored fermentation to avoid the production of compounds with bad tastes. It is interesting to note that those heavy compounds were responsible of the average low quality of the French rhums in the 17th century. The stripping section must have at least 15 copper or stainless steel plates. The reflux has to be made through the use of one or several wine-heater or copper condensers. Rectification is also forbidden and on exiting the column, the distilled liquid must have an alcohol concentration between 65 and 75% abv (130 to 150 US proof). These specifications have been edicted to fit all the existing columns in Martinique. They are not hence discriminating to any column but rather guarantee that the current specificity of agricole rhum will be present in the rhum produced in the columns to come. 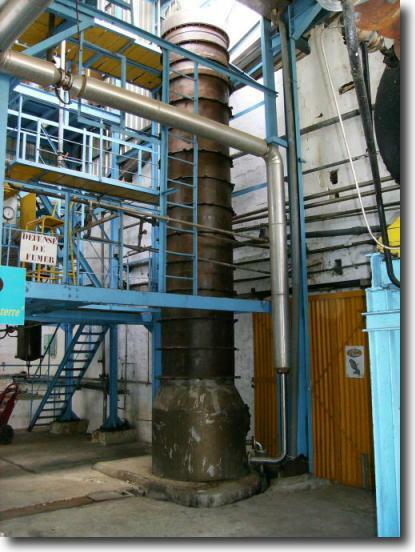 Rhum getting out of the distillation column has typically an alcoholic grade around 70 % abv (140 US proof). It is hence unfit for human consumption (at least for most of us). Furthermore its aromas are not yet fully developed. Rhum is put into tanks (stainless steel or wooden ones) for a few months (at least 3 months according to AOC specifications). Rhum is said to round itself, it loses any astringency and becomes soft to the palate. Its flavours develop themselves, giving a feeling of completeness without any harsh sensation. If distillation must take place in a distillerie fumante (local name for running distilleries), aging activities can take place elsewhere. Some well known brands like Habitation Saint Etienne specialized in rhum ageing and blending and have their rhum distilled at other plants in Martinique. According to AOC specifications, rhum blanc (white rum) must have stayed at least 3 months and no more than 3 months if it has been kept in wooden barrels. Hence wooden barrel aged AOC white rhum is exactly 3 month old. It must also be absolutely colourless. To be sold, rhum blanc (AOC or not) is watered to alcoholic concentrations ranging from 40% abv (80 US proof) to 62% abv (124 US proof), most common concentrations being 40, 50 & 55% abv (80, 100 & 110 US proof). Rhum can also stay a bit longer in oak barrels. A few months later (at least 12 months according to AOC specifications) , the rhum has developed an amber coloration acquired from its contact with the wood of the barrels. Such rhum is called Paille (straw). This kind of rhum is also sold under the ambré(amber) designation, even if Martinique ambré rhum is usually at least 18 month old or event 24 month old ( as Depaz amber rhum for example). Rhum may also be aged of more than 3 years in oak casks and be designed as rhum agricole "vieux" (old agricole rhum) under AOC designations. Oak barrels used for AOC rhums vieux have to be made of oak and their capacity must be under 650 litres (172 US gallons). Non white rhums (paille, ambré & vieux) are usually bottled on site or in the area. The former distillery, Dillon located in Fort-de-France suburbs has been converted into an ageing and bottling facility at the end of the 2006 sugarcane campaign. The facility is a warehouse for Dillon, Depaz & Saint James rhums (Dillon rhum being distilled at Depaz and Saint-James facilities). Rhum blanc (white rum) to be sold outside of the production island is usually shipped in large containers. Bottling is then performed locally to the intended saling area. It helps cutting costs and saving energy by avoiding unecessary transport of the bottle glass. For example, Saint James white agricole rhum sold in Europe displays on the bottle a bottling code of "94018 A" which means bottled near Charenton-le-Pont, probably at the former Cusenier distillery plant.